To create in complete freedom (or only with self-imposed constraints), without any input or influence from others, and to produce works of art on commission are two art forms that are experienced very differently. At first, I approached the second one with caution, for fear of automation and complacency. I do not like to create to obediently please. I choose to offer a meaningful work that will question my clients, make them think and grow. I consider that a successful commission is one that brings to the client an unexpected conceptual representation of the subject matter. With this creation, I continue my search for symbolic vocabulary related to human anatomy. In the case of the heart, I wanted to show it in all its glory and as a precious object, hence the use of gold color instead of red, which I found too directly related to the flaying of a body. For me, a red heart seems to be too individualized. In my mind, a red heart must have an owner. And I was rather looking for a symbolic heart that would live in the world of ideas, which better corresponds to the direction of the current anatomical series. Often considered as the central organ of the body, for its position in the thoracic cage, the symbolic heart is also associated with the number 0, the absolute center of the Cartesian plane. For these reasons, I placed the heart in the center of a square canvas. In my research, I also read about a kind of Indian spiritual tale that tells that it was a beating heart, with its movement of systole and diastole, which was at the origin of the movement of expansion and resorption of the Universe. I liked the image very much and I took it as the main inspiration for the work. This triptych is a metaphor for the origin of the Alliance, which materializes in the form of a golden ring. The painting tells a story of creation, from the smelting of molten metal to the wearing of the ring by the conscious hand. A work that emanates the modernity and dynamism of today's PSAC, as well as its struggles, failures, and victories of the past. A union that endures through time from the beginnings of the industrial era in Canada to the technological age we know. A doctor and her boyfriend just bought a new house and wanted to add life, light and open space in a particular room. They wanted a painting that represents the idea that it is not the attainment of a final goal that is important, but rather to find one's happiness on the path, and appreciate every step and every moment of the process. I create this large scale painting to illuminate a room to which we have sought to add a window. In the literal or figurative sense. We finally opted for a window on the dream, a ''feel good'' painting. 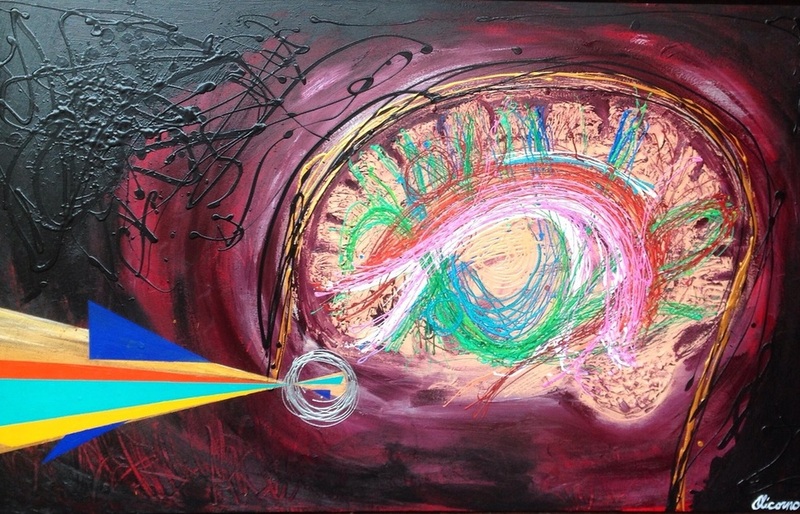 A girlfriend contacted me with the clear idea to offer her newly graduated boyfriend a painting of a brain mapping since he was currently highly passionate about this topic. I created a young, boldly textured and dynamic work, that could fuse his interest in art with his passion for science.